Projectors vs TVs: Should You Ditch Your Flat Screen for a Projector? Projector vs TV: Which is Best For You? "How does the quality of a projector compare to a flat screen?" Our Projector Experts hear this question every day. Let us assure you, in the flat screen vs projector showdown, the projector wins with a knockout. When you compare a projector and TV with similar specs, the projector easily provides just as clear and crisp an image as the TV. 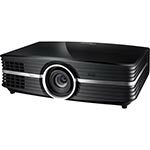 However, the projector's image will be double, triple or quadruple the size, making those lifelike colors and sharp details even more noticeable. Imagine the look on your friends' and neighbors' faces when they see the glorious 120-inch HD display in your living room and realize they paid just as much, if not more for their puny 65 inch flat screen tv. It's like experiencing the majesty of the Grand Canyon through magazine photographs vs actually standing on the precipice of the South Rim - the level of awesomeness and immersion you feel is truly difficult to express using words alone. Tip: Make sure your projector is bright enough for your environment. Dedicated home theaters with no windows can support a 1,500-lumen projector. Rooms with some windows should have a projector 2,500 lumens or higher or use a higher gain screen. 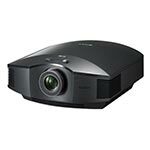 Huge image - most projectors can easily project an HD image that is 4X larger than a 65 inch flat screen TV. Want a bigger image than that? If you have the space and proper lighting conditions, you can cast an image up to 300 inches diagonally. That's more than 21 feet across! Portable - good luck moving that bulky and extremely heavy, yet super fragile, flat screen TV. Want to take it to your friends house to watch the game? It'll sit very nicely in your car seat. Try that with a flat scren TV. Spend less at the movies - with a home theater projector (and a nice sound system), you can recreate the cinema experience without ever leaving your house. And best of all, your refrigerator won't charge you twenty bucks when you want a soda! Plus, no sticky floors or grimy armrests - YUCK. Just make sure to pick one that is bright enough for your environment. Use our projector finder to find a projector that fits your space. Also, check out Screen Innovations Black Diamond screens which allow for lights-on projecting by increasing contrast ratios more than 300%. Watching late at night or in a dark room can lead to eye strain. Difficult to dial down the brightness without muddying up the image. Shipping and Transporting Home theater projectors weigh between five and 20 lbs. They can typically be shipped for less than most flat screen TVs. 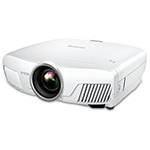 We offer free shipping on all projectors and screens plus free 2-day shipping on projectors $799 and higher. Due to their fragile nature, flat screens are usually more expensive to ship. TVs in general are much harder to move from room to room. It is usually a two-person operation. Because they are cheaper, easier and safer to transport, projectors are like movie theaters with a handle. Installation Not required. But if you do install your projector, you'll find it's as simple as setting up a ceiling fan. Projectors can be removed from an installed location and used in another room, or even outdoors. Also not required. Plasmas TVS should be installed professionally. Projectors are easier to install than plasma TVs. Once installed, projectors can still be moved from room to room and house to house. Curious about which projectors would be best to replace your current flat screen? Here are our customers' top picks.